Monterey’s Cathedral of San Carlos Borromeo, also known as the Royal Presidio Chapel, reopened recently after an extensive two year restoration. Work included seismic retrofitting, renovations to alleviate the moisture problems that plagued the chapel for more than 200 years, rebuilding of 80 percent of the rear walls, and the removal of layers of paint and plaster to reveal original decorative painting. Blocks of those paintings have been preserved for viewing. Objects returned to the Cathedral include the crucifix brought from Barcelona, Spain, in 1880; the 19th century Stations of the Cross, statues of the Sacred Heart and St. Elizabeth of Portugal, and paintings that have been kept in storage since restoration on the cathedral began in May 2007. Junipero Serra established the first church on the cathedral site, located in Monterey’s Presidio, in 1770, and it is the oldest continuously active worship site in California. George Washington was president of the United States in 1795 when the current building was dedicated as the Royal Presidio Chapel, the official chapel of the Spanish Governor of Alta California, Jose de Arrillago. 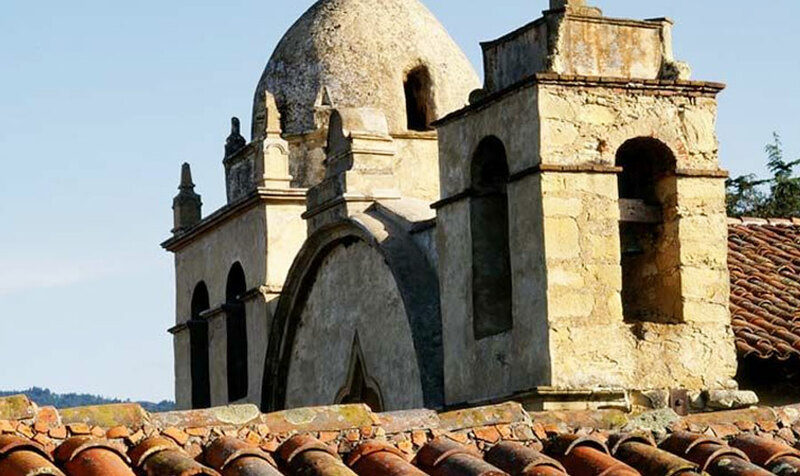 The chapel is California’s first stone building and reflects the exquisite Spanish colonial style of the time. Ornamental arches and portals carved in sandstone make the church one of the most beautiful of all the Missions The cathedral, the oldest building in Monterey, was designated a National Historic Landmark in 1961. The Royal Presidio Chapel Heritage Center, located next to the church, contains architectural drawings and photographs, as well as memorabilia recalling earlier eras. For information on the restoration and opportunities to visit, see www.royalpresidiochapel.org.